Intex Aqua Wonder features 4.5 inch IPS capacitive touchscreen display with 960 x 540 pixel resolutions. It is powered by 1GHz dual-core processor with 512MB RAM. Aqua Wonder comes with 1.93GB of storage expandable up to 32GB with a microSD card, runs on Android 4.1 Jelly Bean OS. The Aqua Wonder sports 8MP* auto focus rear camera with dual LED flash and 1.3MP front-facing web camera. Connectivity options includes 3G, WiFi 802.11 b/g/n, Bluetooth and GPS. Popular Apps includes File manager, Whatsapp, Facebook, Nimbuzz, Skype. Sensor options includes Light sensor, Motion sensor, G Sensor and Proximity sensor. It comes with a standard 1800mAh battery which claims a back up of upto 3.5Hrs Talktime and upto 72Hrs Standby. Intex Aqua Wonder measures 8.9mm thick and weighs 125 grams. Intex Aqua Wonder Smartphone has a price tag of Rs. 9,990INR. 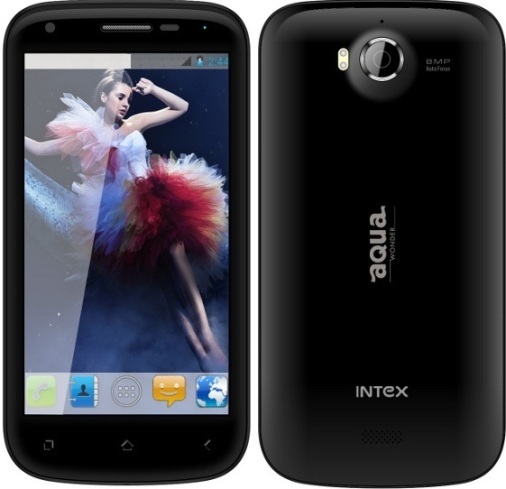 Tags:Intex Aqua Wonder, Intex Aqua Wonder features, Intex Aqua Wonder specifications, Intex Aqua Wonder review, Intex Aqua Wonder details, Intex Aqua Wonder availability, Intex Aqua Wonder specs, Intex Aqua Wonder images, Intex Aqua Wonder pics, Intex Aqua Wonder pictures, Intex Aqua Wonder price.